title: If you ask "why are leaves green?" the usual answer is "because they're full of chlorophyll, and chlorophyll is green," even though "why does chlorophyll scatter green light?" is a great question too. Yes, yes, YES! - It's one of my pet explanations/peeves (and I'm a physicist...). I have no idea how the blue sky got this special-explanation status. Last edited by gmalivuk on Mon Apr 03, 2017 2:58 pm UTC, edited 1 time in total. So apparently plants reflect green light because there's more green light than any other color in sun's radiation, and so it would be too easy to get sunburnt if a pigment absorbed it. I always found these color questions a bit backwards. It seem like we probably evolved color vision to maximize contrast in the landscape, thus forming receptors for sky/water and vegetation, with red to stand out from that backdrop. Nice coverage in there of other cultures who have decided the sky is white rather than blue (because it's blank) or black (because it's empty). Also, I think, some mention of the fact that English "blue" is covered in Russian by two different and unrelated words (one for "light blue" and another for "dark blue"). Fact of the matter is, the sky is blue because we looked at it and decided to call it blue. There's the question whether in a painting of distant hills whether bluing is metaphor or metonymy for distance. As for airplanes, it's not Bernoulli. Bernoulli reverses cause and effect. The air is moving faster because it ran down a pressure gradient, not the reverse. What keeps airplanes up is throwing air downwards. The wing shape is just particularly efficient at doing that without producing much horizontal drag, and the airflow around it is whatever the Navier Stokes equations say is efficient. So birds in the wings won't work. They stay airborne but the air they throw downwards hits the wing and goes back upwards. Also you'd have to bang on the wing with a stick to keep them going. And now I have "Little Known Facts" from You're a Good Man, Charlie Brown going through my head. It is a fir tree. It also gives us wool in the wintertime. The sky is actually red. I know this because when I look through it at something white, that object appears red. wgrandbois wrote: I always found these color questions a bit backwards. It seem like we probably evolved color vision to maximize contrast in the landscape, thus forming receptors for sky/water and vegetation, with red to stand out from that backdrop. The range of visible light isn't arbitrary, though. Hard UV doesn't make it through the atmosphere and damn near everything has some opacity to IR, so the visible range is what both we and the plants had to work with, and it really is strongest in green. Our line (primates after the divergence from the New World monkeys) developed the ability to distinguish red last, before which we would have had only green and blue as primaries; it turns out the reasons are contested and it wasn't necessarily about fruit like I'd thought I remembered! da Doctah wrote: Nice coverage in there of other cultures who have decided the sky is white rather than blue (because it's blank) or black (because it's empty). Also, I think, some mention of the fact that English "blue" is covered in Russian by two different and unrelated words (one for "light blue" and another for "dark blue"). Yup, in the same way that "red" and "pink" are fundamentally different colors in English. I remember this topic mentioned in a What If? footnote. Copper Bezel wrote: The range of visible light isn't arbitrary, though. Hard UV doesn't make it through the atmosphere and damn near everything has some opacity to IR, so the visible range is what both we and the plants had to work with, and it really is strongest in green. Not nececelery. There's a ton of IR re-emitted by warm things, and many insects (and snakes w/ 'thermalsensor pits') take advantage of this. Further, while the total wattage of solar IR is low-ish, the retina is a quantum detector (sorry, comic-woman figure! ), and there are brazilions of IR photons showing up. The more likely explanation for our lack of IR sensitivity is that there aren't a whole lot of phospho-organic compounds with a bandgap small enough to respond in the IR. Now, as to why some people are tetrachromes and can see in the nearUV -- but only after replacing the lens with a plastic substitute -- is an interesting question. I still don't get the people who don't want anything past "air is blue". The one time we actually go on to say something interesting, that actually tells you a bit about how the world works, and somehow it's no good. It feels like answering "why does that car change colors" with "because it has color-changing paint". Thanks for the help! Plainly the sky is full of air, but does that answer actually satisfy anyone instead of prompting the obvious follow-up question? Then why does the sky turn more teal during the day? Why does shining through more air make the setting sun red? You could leave it at "in that context the atmosphere is red" and be accurate, but relatively few things change color that way, so you'd think you would want to offer a bit more about this unusual effect. Rayleigh scattering isn't quantum, at least to the extent that anything in our world isn't. Rayleigh died in 1916. He found one of the few color effects you don't need quantum mechanics to understand, that can actually be appreciated by just about anyone, but let's not take that opportunity to learn anything. Pure research is called "blue sky" for a reason. Of the two answers, line-hair's seems by far more likely to encourage scientific curiosity, and empty-hair's to shut down any further interest. If I were the girl, I know who I'd ask questions in the future. Last edited by chenille on Fri Mar 31, 2017 3:44 pm UTC, edited 2 times in total. I'm not sure if you're being serious. As per http://chemed.chem.purdue.edu/demos/mai ... /14.2.html , liquid oxygen is blue because the dramatically lower volume of liquid oxygen enables a three-body excitation process that is completely improbable when oxygen molecules are further apart. Gaseous oxygen is colorless, period. This was previously discussed in the thread for 1145: "Sky Color". chenille wrote: I still don't get the people who don't want anything past "air is blue". The one time we actually go on to say something interesting, that actually tells you a bit about how the world works, and somehow it's no good. It's not about people asking why colors happen, which is certainly a good kind of question! It's about how many people have this specific cliche as their programmed response to the question of why the sky is blue, often and misleadingly to the exclusion of saying that "air is blue", as if that weren't a true statement, exactly as played out in the comic. It's a case where throwing more terminology at an answer can reduce understanding and really might indicate a lack of understanding on the part of the speaker, too. jozwa wrote: So apparently plants reflect green light because there's more green light than any other color in sun's radiation, and so it would be too easy to get sunburnt if a pigment absorbed it. If that were the whole explanation, then we'd find black plants growing in low-light conditions, for example in the undergrowth in dense forests. Plants adapted to such conditions typically have darker leaves but they're still green. Copper Bezel wrote: It's not about people asking why colors happen, which is certainly a good kind of question! It's about how many people have this specific cliche as their programmed response to the question of why the sky is blue, often and misleadingly to the exclusion of saying that "air is blue", as if that weren't a true statement, exactly as played out in the comic. It's a case where throwing more terminology at an answer can reduce understanding and really might indicate a lack of understanding on the part of the speaker, too. It's similar to Feynmann's response to an interviewer asking how magnets work. It's probably less complex than asking why your hand doesn't go through your table, but the magnet question comes up more often. For example Arthur Schopenhauer wrote something about the Fourfold Root of the Principle of Sufficient Reason. Aritoteles also distinguished between four causes. I suspect you can find infinitely many correct answers to a why question, because infinitely many things could influence the status that is actually true. "Why is the sky blue?" "Because Aliens didn't release lots of red gas into the atmosphere." He basically says that students (and teachers) today learn to associate stories with certain questions, rather than really understanding the underlying mechanisms. This way of thinking and giving meaning to one's life and society in terms of stories and narratives is universal over all cultures, and is in our basic "wiring" as human beings. It is part of what we call "common sense." And it is the way most of the college students that NSF and I talked to had "learned science"--as isolated cases, stories that would be retrieved to deal with a similar situation, not as a system of inter related arguments about what we think we know and how well we think we know it. Story thinking won out. 3. An interesting question would be: Why are children interested in the color of sky and trees, but not in the color of other things, like tomatoes, or anything else? Why are they content with some answers, but not others? Why are so many people puzzled by magneticism but not by gravity? I find the sky interesting because a small amount of air is not blue, but lots of it together are. Some things just have this property. Maybe children didn't learn that yet. Last edited by JohannesWurst on Fri Mar 31, 2017 5:20 pm UTC, edited 1 time in total. Is it a true statement, though? Like I noted, when the sun shines through more atmosphere it doesn't color it blue, it colors it red. It's relatively easy (e.g. first web hit) to make something that shows higher frequencies in scattered light and lower frequencies in transmitted light. Do you suppose blue is really an appropriate description of that thing? Because I wouldn't call it any single color, I'd call it opalescent. Ok, I will admit that largely has to do with components that may not count as "air", but I suspect nobody here has yet intended to distinguish the color of air and atmosphere. And I think even the scattering from air, too, works out to be at least dichromatic - on a planet with a thick enough atmosphere it would continue until the sky lost its hue. None of this is how "blue" things – like for instance the water in the ocean, where everything just gets bluer and bluer the further you look – normally work. How much are we ok with glossing over to allow a simplistic description? Transmitted and reflected light are equally distinct phenomena. "It's because of the color of air, but air is actually dichromatic" is certainly a possibly reasonable answer. I think it's also more honest than the received and rarely understood soundbite. JohannesWurst wrote: 3. An interesting question would be: Why are children interested in the color of sky and trees, but not in the color of other things, like tomatoes, or anything else? Why are they content with some answers, but not others? I think magnetism seems like a special exception to the intuitive perceptions that otherwise generally hold true in everyday experience, so it more readily attracts "why" questions. I'm not sure if children are actually interested in the color of trees. I think adults single that one out to explain, more than anything else. At the very least, plants are ubiquitous and consistent in this quality, so that could have an effect. I definitely think people see blue sky and expect there to be a blue surface somewhere at a distance, as opposed to perceiving themselves peering into a thin blue murk. The fact that the sky also changes color can't not have an effect. When I was a child, the thing I wondered is why the sky appeared "opaque" in daytime but showed the stars through at night. rhhardin wrote: Also you'd have to bang on the wing with a stick to keep them going. As always, this reminded me of a joke I will now mercilessly share with all of you. So a motorist on a long journey is at a rest stop when a large semi pulls into the parking lot. The truck driver gets out, grabs a large stick and bangs on the side of the trailer a few times before moving on. A while later the motorist moves on too and catches up with the semi just as it pulls into the next rest stop. Intrigued, he decides to see what's going on. The truck driver bangs on the trailer's side again and leaves with the puzzled motorist trailing. When he sees the truck driver stop and do the whole routine again, he walks up to him and asks what's going on. The truck driver replies: "Well, I have thirty tons of budgerigars on board, but the truck can't hold more than twenty tons, so ten tons of them have to be flying." The Snide Sniper wrote: I remember this topic mentioned in a What If? footnote. That's good to know. #141, right? I merely had an intense deja vu, and came to the thread only to find everybody talking about the topic as if it were completely new. Is it a true statement, though? I thought that around here we knew that the sky's color is actually violet! We just don't see it that way because of how our eyes work. Copper Bezel wrote: Transmitted and reflected light are equally distinct phenomena. 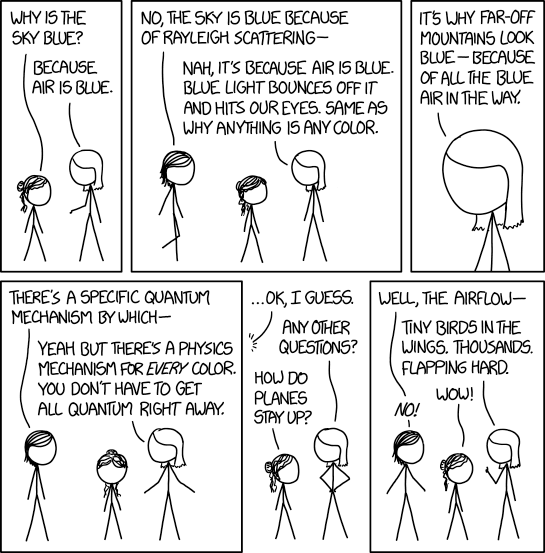 "It's because of the color of air, but air is actually dichromatic" is certainly a possibly reasonable answer. I think it's also more honest than the received and rarely understood soundbite. That's actually my favorite explanation to give my children: "we can't see the stars during the day because sunlight makes the air glow." This can then lead to all sorts of fun discussion topics, like dicromaticity and lasers, without needing to get deeply into the mathematics of the principle. Last edited by Soupspoon on Fri Mar 31, 2017 6:16 pm UTC, edited 1 time in total. I don't think the Rayleigh thing is a good answer to why the sky is blue, at least if the question comes with no context. You should tell someone about Rayleigh scattering, if she/he had a problem that she/he could solve by knowing about it. Hmm... Maybe practical application isn't the only criterion for a good explanation. For example when you explain a magic trick, you break a unfamiliar phenomenon down to a familiar phenomenon. That's like giving a proof of a mathematical equation by reducing it to obvious, accepted axioms. Does the Rayleigh scattering explanation do that? I'd say, for most people, it replaces the problem by another problem. "The sky is blue, because air is blue." on the other hand is nearly a tautology. Here I found something that claims, that children are satisfied with simply a bit of attention. I’ve found that, when I try to answer children at this stage of development with the reason for something, they are left cold. After conversing with thousands of children, I’ve decided that what they really mean is, “That’s interesting to me. Let’s talk about that together. Tell me more, please?” When I’ve connected with children and begun to spin a tale to answer this question, they’ve sat enthralled. Last edited by JohannesWurst on Fri Mar 31, 2017 8:25 pm UTC, edited 1 time in total. I thought leaves are green because they're chock full of chlorophyll, which is green. Why is chlorophyll green? Doesn't matter; what matters is that chlorophyll can drive photosynthesis, and when you've found a chemical with such an awesome superpower, you're not going to gripe about its color. Oktalist wrote: And belly button fluff is blue because the phosphors in our sweat absorb more of the blue cosmic rays stored in the cotton that make our shirts. I think you might be a little confused there... your sweat absorbs the non-blue cosmic rays, leaving just the blue ones behind. Actually, I think giving the quantum mechanical explanation for the sky being blue is totally justified. Almost every color in the natural world is an absorption color. Pigment molecules absorb all of the other colors and the energy dissipates into various invisible forms, such as thermal vibration, and the color we see is all the rest that isn't absorbed and reflects instead. This is the "color" of the pigment. Blue, on the other hand, is usually an exception. There are not many naturally occurring blue pigments. Natural blues in bird feathers, butterflies, and the sky are almost always due to preferential scattering effects (whether it's Rayleigh scattering or some kind of Bragg diffraction or whatever) rather than actual absorption of the other colors. This is why they change more dramatically with viewing angle and lighting. So, while I sympathize with the point Randall is trying to make, I actually disagree with it. The blue sky isn't just like any other color. People seem to intuitively "get" that the blue sky and iridescent bird feathers and butterfly wings are different from "normal" colors, which is why we always get questions about those things rather than, say, apples. An episode of some YouTube thing called Physics Girl I saw recently claims that that is not the conclusive answer, and no answer is presently conclusive. Among the alternative explanations proffered was that at a past time in evolutionary history, purple photosynthetic organisms (that absorbed only green light, possibly because that was the strongest part of the spectrum) were dominant -- my memory of the details now are spotty, but it was something that thrived in an era of different chemistry than today, living off some kind of hydrosulfide I think, and possibly being dominant immediately following the snowball earth period -- so the only light readily available to the ancestors of today's plants, which evolved their chlorophyl, was the leftover ends of the spectrum. After those purple organisms died out (thanks possibly to the oxygen catastrophe changing Earth's chemistry? again, details are spotty in memory), the green ones inherited the Earth, and those are what we still have today. Also proffered was the idea that chlorophyl happens to be green and evolution settles on good enough, even if it's not perfect, so plants are green by a happenstance of evolution, simply because there's no good reason for them not to be. Plants use the "green" pigment chlorophyll to process light because the first eukaryotic cells with chloroplasts evolved in the ocean, at depths where green light does not penetrate. Broader spectrum pigments may be possible, and may someday discovered by computation and genetically engineered into crop plants, greatly increasing productivity. Or not; chloroplasts are tuned antennas that channel photons into a two-stage process that produces enough energy in one tiny spot to strip the protons (hydrogens) off a water molecule; it may not be possible to design a broad spectrum antenna, rather than the current system which captures mostly red and some blue photons. This suggests a clever light hack for greenhouses. "White" LED light bulbs start with monochromatic blue light from GaN LEDs, and use pigments to convert some of the blue photons to broad spectrum yellow, making faux white (the monochromatic blue is near the peak for melatonin destruction, but I digress ...). Imagine a greenhouse glazing panel that passes red and blue, but absorbs green with pigments that make broad spectrum red with it. Now the light inside the greenhouse will be bright red with a tinge of blue, and the plants will appear black. For the same amount of sunlight, there will be more photosynthesis; perhaps more trays of plants stacked up to use the incoming light. This may also confuse leaf-eating insects, which may have trouble seeing the leaves. If anyone develops "green conversion greenhouse glazing" (redhouse? blackhouse? ), I have a 40 foot greenhouse that needs reglazing. China has millions of hectares of greenhouse, so you would have a great market for about two weeks, until they copied your process. I have heard that if you descend a well or otherwise get yourself at the end of a long tube that points far enough away from the Sun, you can see stars even in the middle of the day. Sadly, Snopes has ruled this one false (though traces reports of it back as far as Aristotle). Opus_723 wrote: So, while I sympathize with the point Randall is trying to make, I actually disagree with it. The blue sky isn't just like any other color. Thanks! This is the point I was trying to make, and I think you did more concisely. Rayleigh scattering might often be quoted without much real understanding of its significance, but "same as why anything is any color" just isn't true. You could say the ocean is the color of water, but the color of the sky both works differently and is more interesting than "air is blue" makes it out to be. Pfhorrest wrote: After those purple organisms died out (thanks possibly to the oxygen catastrophe changing Earth's chemistry? again, details are spotty in memory), the green ones inherited the Earth, and those are what we still have today. keithl wrote: Broader spectrum pigments may be possible, and may someday discovered by computation and genetically engineered into crop plants, greatly increasing productivity. In fact broader spectra do exist, and purple organisms haven't died out, just moved into more marginal habitats. Lots of bacteria and algae have additional antenna pigments, either carotenoids or phycobilins, that capture energy from other frequencies and pass it to chlorophyll or bacteriochlorophyll. These include purple sulfur bacteria, which are often under green organisms and so benefit from scooping up different colored light, and things like red and brown seaweeds, including some in deeper water where ambient light starts to fall off. Just not green seaweeds and terrestrial plants. As for them, it's important to note that they shouldn't always capture as much light as possible. You need enough chlorophyll to get by in relatively dark times, but it's a photosensitizer, and when the amount of light goes up whatever chemical energy you don't use becomes potentially damaging. This is why green plants have their carotenoids, to help quench any excess. So I think it's probably not surprising they don't have extra antenna pigments to absorb even more, even though it is possible, and just stuck with the primary green one. WHERE DOES RANDALL GET THIS STUFF? Two of them are my own memes: "The sky is blue because air is blue," and "airfoil lifting-force misconception" come from http://amasci.com/miscon/miscon4.html#mis, injected into various Newsgroups in the early 1990s, then finally on www 3/1995. Spreading slowly ever since. Viral physics education! Subverting your (incorrect) textbook knowledge. Are any others XKCD-worthy? How about The Scientific Method doesn't exist, or perhaps Infrared light is not a type of heat. Perhaps because the color of air is, in fact, none? The sky has a nearly unique mechanism for determining what color it will be, and it changes depending on where you are standing in relation to the sun. We observe a blue sky only under specific conditions. Under other conditions, we observe a red sky, or an orange sky, or sometimes a purple sky. Are any of these the "color of air"? No. The sky is only only blue when there is relatively little of it between the observer and the sun. At dawn and dusk, when there are a couple thousand miles of it in the way, it shifts down the spectrum. This phenomenon is sufficiently unique that it deserves to be properly explained, and simply stating that the color of air is <blank> is factually, provably, and easily observably false. Agreed, Randall messed up here. Air is not blue; it's colorless. "It's why the rising moon looks orange - because of all the... blue air in the way? Err... wait a second..."
Why are people assuming Randall is siding with Blue Air Woman? I mean there's something in what she says but it's basically wrong. The whole idea that a colour inheres in an object, that the object is a particular colour, applies only to things that reflect diffusely, with roughly the same spectrum in all directions, independent of the angle of incident light and under most normal lighting conditions. These assumptions simply don't apply to air or glass. I'm not sure what the point is, but maybe it's a dig at the idea that everything needs to be simplified to the extent that the actual interesting and distinctive phenomena get thrown out with the bathwater. Last edited by orthogon on Sat Apr 01, 2017 10:51 am UTC, edited 1 time in total. Yeah, you can't ignore that Blue Air Woman is also Tiny Birds In Wings Woman. The first explanation is like Electrical Fluid, as a better explanation than diving straight in to Cooper Pairs or somesuch. The second (at the very best) explains why longer wings have more lift (all else being equal, which it often isn't) but doesn't help with the simple issue of stalling speeds, never mind upper-end speed responses ("what's the carrying capacity of a hundred fast-flying swallows in a delta-wing?"). orthogon wrote: Why are people assuming Randall is siding with Blue Air Woman? I don't know about people, but I'm assuming that because he made the same argument himself in What-if 141. Ae7flux wrote: Well it's pretty weird argument. Since when has the answer to "why is x y-coloured" being "because x is made of y-coloured stuff". That's a paradigmatically bad (or joke) answer.